So last time I blogged about knitting, I had not finished Gnome for Festivus, I was planning to frog Argante, start Gaenor, and cast on for some fingerless gloves. I should be further along but I decided to frog the first one at about the same point as this picture. With the previous one, I didn’t think the wrist part was long enough. 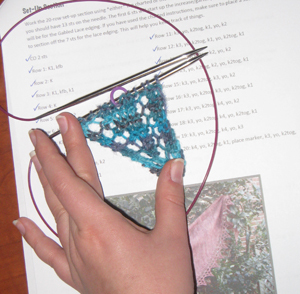 The pattern called for 16 rows before the thumb gusset. 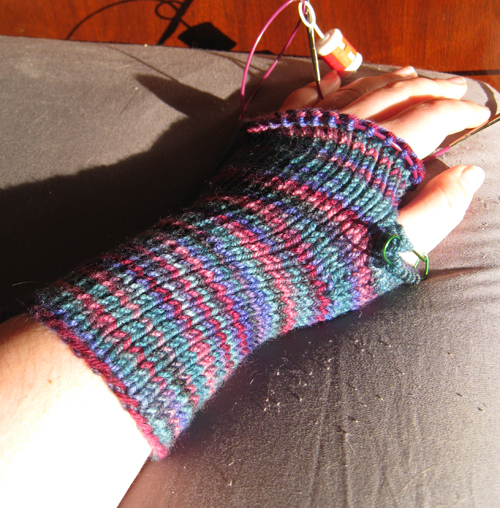 I wasn’t happy with it, so I ripped back and what you see here is 30 rows before the thumb gusset. The pattern is Basic Fingerless Gloves by Sue Brady [rav link] but I just did basic stockinette instead of the a k4, p2 pattern (due to the yarn being already patterned enough). 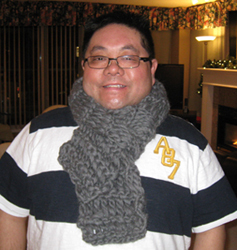 The pattern is Instant Gratification Scarf by Cyn [rav link] which uses a twisted drop stitch. I used two skeins of Blue Sky Alpacas Bulky Natural (50% merino, 50% alpaca) because Ben was petting and admiring the softness of my Malabrigo Rasta scarf. Yup. Just. Keep. Knitting. Your mitt(s) are looking good. 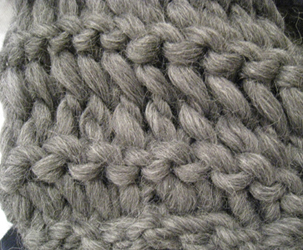 That’s a very neat stitch pattern in the scarf, and at least you’re knitting! I did cast on for the baby blanket I’ll need to gift in a couple of weeks, and 16 rows in, I’m content. Maybe I’ll knit instead of wiggling my apps into place tomorrow? I’ve got Gaenor in my queue. This is going to be the year of the shawl/shawlette/scarf for me.